'Living made easy' provides free basic listings for local retailers that sell daily living equipment in one or more areas of the country, but not the whole UK. These free listings include the retailer's name, address and phone number and whether they are a member of the British Healthcare Trades' Association or have been accredited by their Local Authority. Local retailers can also purchase Premium Listings for £125 + VAT per year. 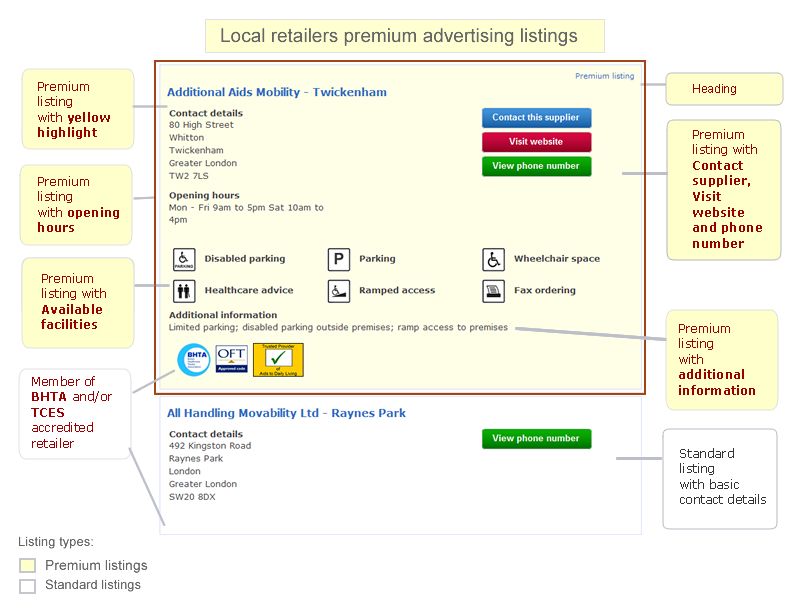 Premium Listings allow retailers to include further information, e.g. their opening hours, parking, disabled access, etc. and any special information about their services. It also allows customers to click through to their website or email them directly for more information and is a great way to stand out from other companies in the listings, generate leads and raise awareness and promote your services. See an example of a Premium Listing below. If you would like to book a Premium Listing please call 020 7289 6111 Option 3 or email our marketing department.